Last night I made "Butternut Squash Ginger Soup" from La Dolce Vegan. I haven't used this cookbook at all, since I've had sorta mixed results from their other books. 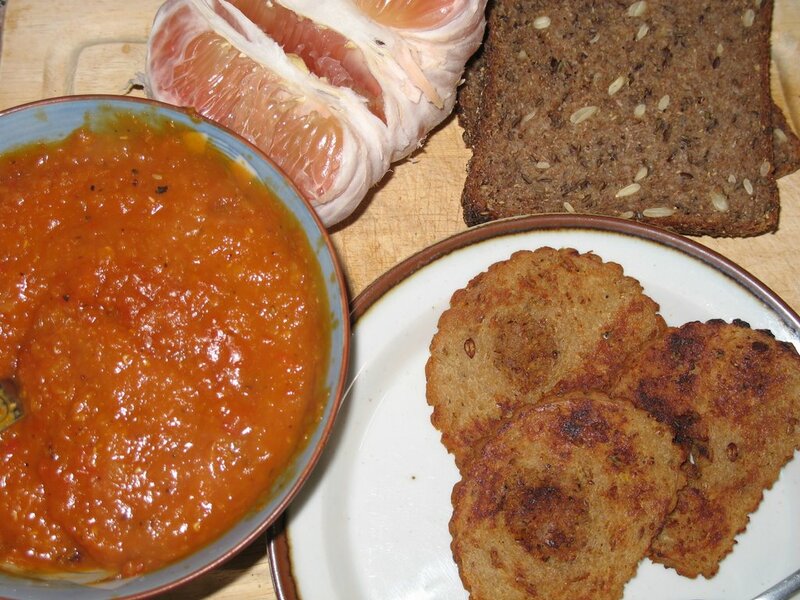 But this was a nice recipe - it's got butternut squash, red lentils, ginger, veggie broth... I added garlic and some roasted/crushed fennel seeds. We had a big family dinner last night, to celebrate some relatives coming to town, so I made a quadruple batch and fed about 12 people... other people pitched in lots of other stuff too, so it wasn't just soup. Sorry to say, I forgot to bring my camera and take a picture. So, today, for lunch I had some of the left over soup, a few slices of some amazing rye-flax-sunflower seed bread, a few slices of grilled "Celebration Roast," and a half of a pomelo. Have you ever had a pomelo? I think that's what it's called. It's gigantic - yellowy on the outside and reddish pink on the inside. It's like a giant grapefruit sort of, but much sweeter and you can just eat it. The rind is THICK and there's a lot of very bitter pith, so I peeled off all the skin. It was a very tasty fruit. 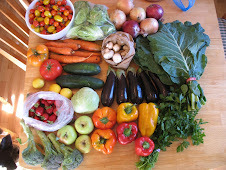 I'll get more at next week's farmers market. A couple of days ago, Musty said "I want some beef stroganoff." I knew I wasn't going to make any beef anything, but he was willing to try some seitan stroganoff. I've never had this dish before, so I didn't know what to expect - but I remembered that VwaV had a recipe. I made it tonight, and we both loved it! I followed Chris's lead, and made the "beef" seitan from La Dolce Vegan. Great tip! what an easy and successful seitan recipe. I made a generous half recipe of the Seitan Stroganoff, and left out the portabellos (since I'm not a huge mushroom fan). It was rich and tasty. Also I found these nice ribbon noodles just like egg noodles, but with no eggs. Fun noodle shape! Just so you don't get worried, we had a big salad with dinner too. I want to make that soup! I just got La Dolce Vegan for Christmas, and I've only made one recipe from it so far! That soup looks so bright and zesty! You know, before I was a vegan, I used to really hate beef stroganoff (beef AND cream? are you insane?) but since seeing so many delish vegan ones on blogs, I might just have to revisit the issue. Yours looks like a great cold-weather meal. P.S. Add Daiku and me to the potatoes/chard fan club. We made it, and LOVED it- thank you! Okay, I will have to get a pomelo this week at the farmer's market now that I hear your description. I am not a fan of grapefruit, but it sounds like they are much sweeter. 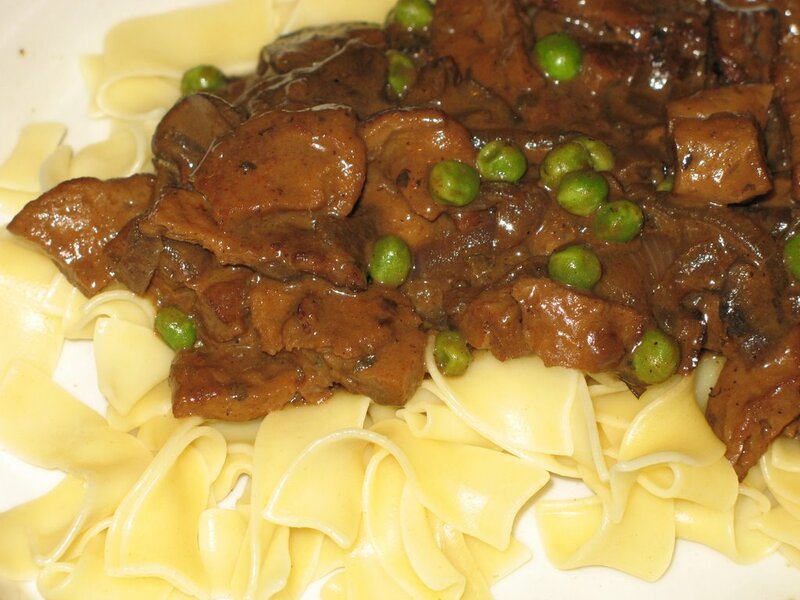 That's funny that you used to hate beef stroganoff. I thought this dish was really good, but I've never had actual beef stroganoff. Also, I was telling Musty tonight how many "meat" dishes I've only discovered after becoming vegan. Ha! I'm SO glad you and Daiku liked the chard and potatoes!! You can imagine how excited I was to find that dish when I was in Croatia... after weeks of eating nothing but bread and raw bell peppers! I love pomelos, they are my favorites, right after tangelos! If you ever have the chance to eat tangelos, get the kind that look like they have an out-y belly button, they are fantastic!